This memorial day weekend I was invited to judge a kirtan competition for the Hemkunt Foundation. This is their second year this competition was conducted and that I was judging young kirtaniyas. The organizers had selected an interesting set of raags for the competition: Sarang, Suhi and Sorath. 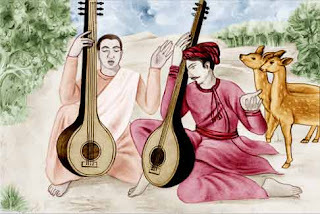 Sarang, especially Vrindavani Sarang, is not a rarity among current kirtaniyas. However, despite their simplicity and beauty, Suhi and Sorath are forgotten raags, Suhi even more than Sorath. So I decided to do some research on existing Suhi compositions. Because the majority of existing Suhi renditions are very similar to Alhaiya Bilawal, my research also included media in that raag. The following playlist includes Suhi and Alhaiya Bilawal compositions that I collected before the competition. If you listen to these compositions, it is clear that there are two distinct forms of Suhi sung by recent and contemporary kirtaniyas. Although both seem to originate from bilawal, the most prevalent of the two stresses the vaadi note 'Pa.' Gyani Dyal Singh and his disciple Bhai Kanwarpal Singh, stress 'Ma' as the vaadi and the effect is just not the same. Next time I see Bhai Kanwarpal Singh I will ask him about the reason for the difference; however, at this point my conclusion from the collective set of media data is that 'Pa' should be the vaadi for Suhi. In fact, in most compositions the use of "Ga Ma Pa Ni(Komal) Dha Pa," following a rest on vaadi 'Pa' is distinct to Suhi in gurmat sangeet. This is also a distinction of Alhaiya Bilawal making these raags very similar in their feel. "Sa Re Ga Ma, Re Ga Ma Pa" with a slide from Ma to Re reminds one of Bilawal, creating a minor differentiation between Alhaiya Bilawal and Suhi. For classical Kirtan enthusiasts I highly encourage listening to Kishori Amonkar's rendition of Alhaiya Bilawal on youtube. In Chotti Teen taal (which also appears prominently among Suhi renditions), she uses only 6 notes to define the raag in her bandish. Simplicity of the composition and clarity of meends create an extraordinary atmosphere of tranquility. Just like a masterful Suhi, which is often sung in the hot season, this rendition has a cooling influence on the mind.